For more than 400 years, the bulb fields have been the symbol of the bulb-growing area of Holland. Most of the bulb fields are found between the villages of Lisse, Hillegom, Noordwijkerhout and Voorhout. The levelled dunes appeared to contain the perfect ingredients to grow bulbs. This is how the region grew to become the center of the bulb trade. 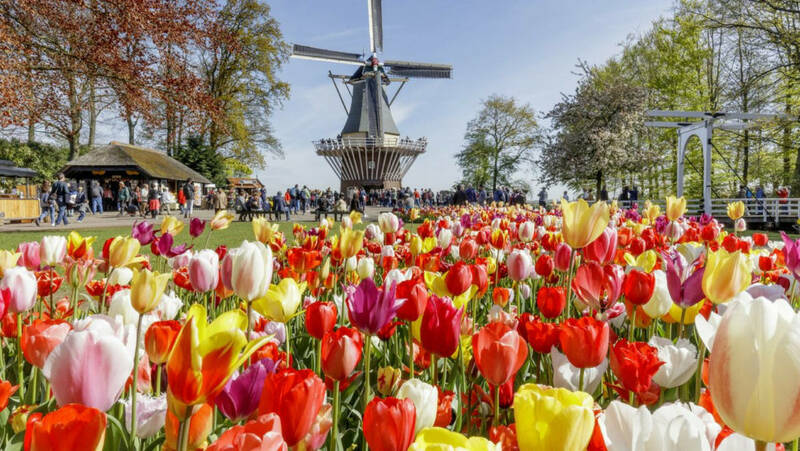 Of all flowers, the tulip has become the best-known bulb flower of the region. Apart from tulips, large amounts of daffodils, hyacinths, dahlias and white calla lilies are grown here. In spring, when the flower fields are in full bloom, this makes for a beautiful and colorful landscape. The bulb area is more than just the flower fields. Right next to the flower fields you will find the most beautiful polders and lakes of the Netherlands. Together, these lakes form one of the largest sailing areas of the Netherlands. The villages of Warmond and the Kaag island are situated right on the water. This area is also known as the Green Heart of the Randstad (i.e. the urban agglomeration of Western Holland). In this area, crowded with mills, you will find many small farms offering lots of delicious regional products, the best known of which are the Gouda cheese and the cumin cheese. The apples, pears, strawberries and cherries from this area are also very tasty. The vast lakes of the bulb area are ideal for a lovely boat trip. Enjoy the beautiful polder landscape of this special region during a typical Dutch boat trip. In spring, everything is in full bloom. Of course, also out of the bulb season, the area is definitely worth a visit. Want to know more about our boat trips in the bulb area? For an overview of all boat trips, click here. Welcome on board!